Using Flixel to Create Dynamic Images | Mr Geek and Gadgets Mr Geek and Gadgets | Sci-Fi, Superheroes And Kids Activities. Being a photographer, I am always looking for new ways to improve or add a new dynamic to my photography. I had seen some photographs on the internet of stills with one part of the image moving and wondered how they had done it. Now I know and how it was done. 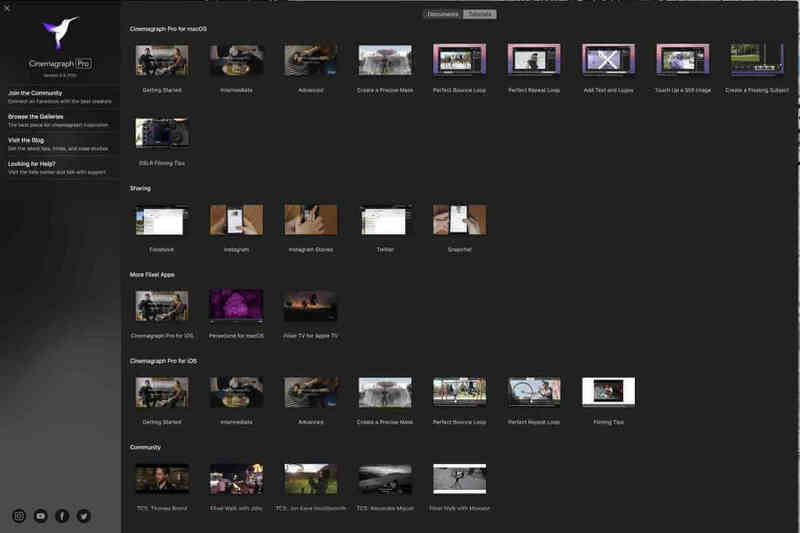 Thanks to Flixel, I am now able to create my own stills with moving elements, similar to the way animated GIF’s work. This is where the concept of Cinemagraphs enter the fray. 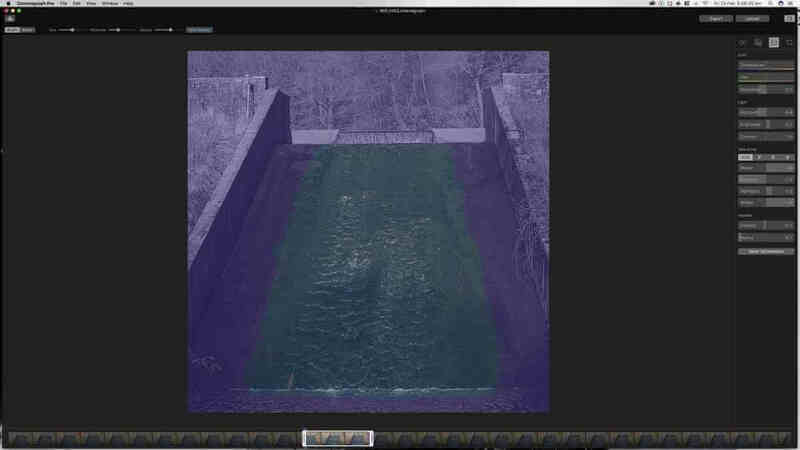 I have been using the Cinemgraph Pro app from Flixel, which allows me to create a new type of story telling and grab the users attention to a specific object or area within the Cinemagraph. This is my review of Using Flixel to Create Dynamic Images to enhance my Social Media interaction. For me to get the flag like this, I filmed this flag at 120 frames Per Second in 8K. I then transferred the finished movie to the Cinemagraph app. The app will ask where you want to save source file. For Mac’s it asks to save on your iCloud Drive. You will need to make sure you have enough space on your iCloud drive, as the source files can reach over 500mb each. My Final animated image, is that of a fountain at a local park. By using a little imagination and creativity, I knew the motion of the fountain would create a totally different effect and I was right. I used the Cinemagraph app to make the water of the fountain to create the motion of the water being forced upwards, while the water around the fountain remain calm. This created a totally different effect and it gained more comments an Instagram story than my usual posts. You have gone out with your DSLR camera or cell phone and created a few movies. How do you then move from your DSLR or cell phone footage to creating a cinemagraph? Well it is a lot more simple than you thought. However, there are some basic rules you need to think of while filming your initial footage. Your subject has to remain Still as possible with little or restricted movement as possible for you acquire the desired effect you are looking for. Also, You will need a tripod or something steady to keep your DSLR or cellphone as still as possible. Too much movement from your camera may make your footage unusable. When you first launch the Cinemagraph App, you will be asked to sign. Once you have signed in, you will be greeted with these two screens. 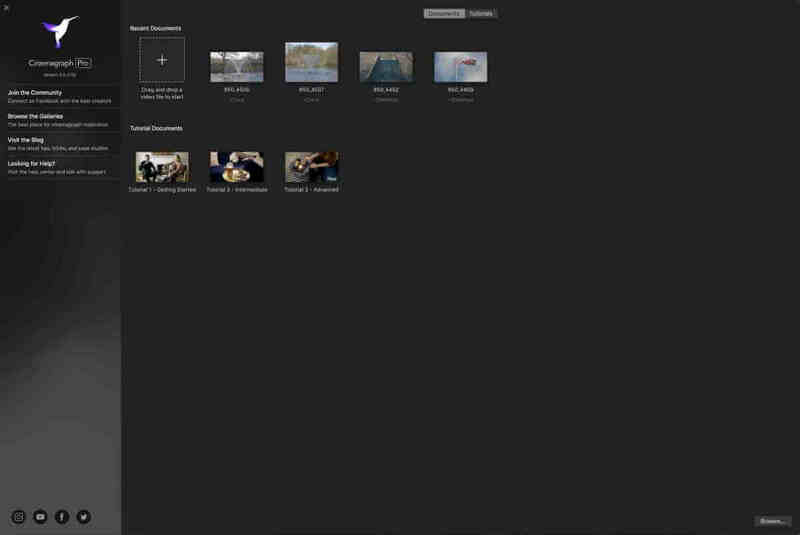 You can either upload your movie or you can browse through the tutorial videos if you are stuck on a specific project. Masking out the area you wish to keep animated or keep the motion for, is very straight forward. 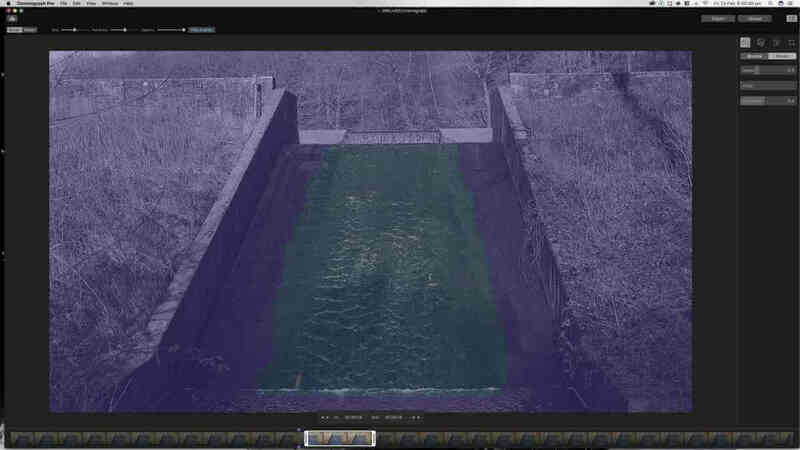 If you have ever used an image processing software like Photoshop or Lightroom, the process is very similar. With your mouse, click on the top left Brush button and your mouse will become a white circle. You can adjust the size of the brush using the sliders right next to the Erase tab. You also change the opacity of your brush and how hard the brush to be. Once you are happy. Click the show Overlay button and your can see the area you are editing. 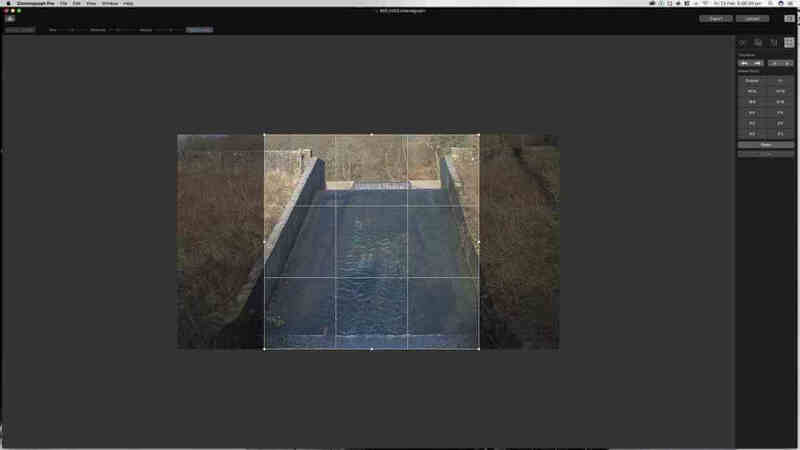 Want to resize your Cinemagraph to fit different social media types? Well that is easy too. At the top left of the screen there is a crop button. Press it, then a set of twelves options will then appear. Cycle through until see the option which suits your needs, then press okay. However, to confirm the changes, hit the Infinity button to change to back to the editing screen. The resizing can be changed back at any time by hitting the crop button once more. The change is only permanent when the cinemagraph is exported. Wish to make some tweaks to the brightness, the saturation, the contrast? Well those options are available too. To the left of the Crop button is a tab which look like slides. Hit that and you can make subtle changes to your Cinemagraph. 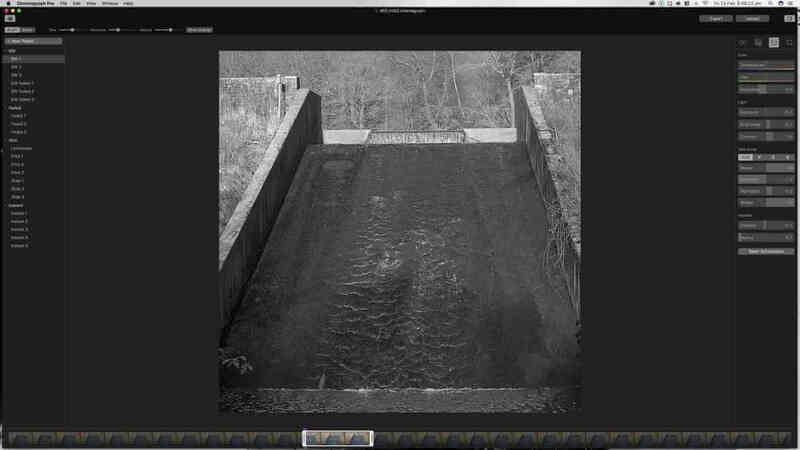 You recorded your Cinemagraph in colour but want to convert it to Black n White, you can do that too with the click of a button. Just as you make changes with your stills with ‘Presets’. You have the same option with Cinemagraph Pro. To the very left of your app, above the brush, there is your presets option window. You have many presets to choose from. You can even make your own preset if you so desire. It is easier than you may think. There is also a tutorial on how to make your own presets and how to use them at the home screen. Exporting and Uploading: You have completed your project, you are happy with the end results, now it is time to export your project to MP4 format GIF or TIFF. I would recommend you stay with the default option of MP4. You also upload to the Flixel website so you don’t have to upload to your own website, just like you can with Youtube. When you upload, add the detail description of your project. This will upload to the Flixel website, where you can get an embeded HTML code to use on your website/blog/wordpress site. Or you can just keep it private if you wish. Buzzoole, an influencer marketing website have partnered with Flixel to allow content creators gain the maximum amount exposure with their audiences/clients. Those who have used Flixel’s Cinemagraph apps, have seen a marked increased click rate of over 60%, compared to other add campaigns which see less than a 5% click rate on their advertising. With email advertising, companies who just use standard animated GIF’s compared to a Cinemagraph GIF or image have produced over a 72% jump in transaction-to-click rates just by using a Cinemagraph. Using Cinemagraphs in a social media advertising campaign as an influencer will increase your engagement, as well as boost any sponsored content click-throughs up to 72%. Will these content sponsors use your services again? Very likely, if they are seeing higher transaction-to-click conversion rate on their website or products. Individuals or brands connected to or associated with Buzzoole influencer service, can enjoy a whopping 50% discount on Flixel products/plans. This is a huge discount as Flixel’s Business Plan cost $299 a annually, which brings the annual cost down to $149.99 a year. As a content creator and using a Cinemagraph for your Facebook ad campaigns regularly; will see a marked increase in engagement rate increase of 85% on Facebook, instead of a 0.83% by using just a still image. Not convinced yet? I think you will be once you start using Cinemagraphs in your emails, social media advertising campaigns. If you would rather less then a 1%transaction-to-click rate, then stick with your standard still images. I know what I am going to be doing. I am going to be mixing things up and using Cinemagraphs in a lot of Blog posts, Instagram posts – Stories, because when my Cinemagraphs convert into higher engagement and click throughs. It means I get more paid work my social media and my chances of higher page views also increases. There are only two options or plans to choose from. Professional and Business. Professional: This plan costs $199.99 a year. It alls you to use and download the Mac OS and IOS versions of the software. Business: This plan is way more expensive, however, you have access to their entire library of training and web resources. The cost is $299.99 a year. With the Business Plan, you gain access to the Professional plan plus more. Persecond MacOS, 30 minute consult with Flixel. HD Cinemagraph hosting options with unlimited Cinemagraph uploads. Over 100,000HD embed views/month. The ability to add your own watermark to your uploads. If you use Cinemagraph for business use, then yes. The Business Plan would be your best option. If the cost can be recovered each year through your clients, it would be a worthy investment. Having used the app for just over a week now, I have had the chance to have a play and put the software through its paces. I found it incredibly easy to use and very user friendly. It is very much like using the Photoshop of movies. How will this help your social media? You can already upload movies to your Instagram, Twitter and Facebook accounts. The question is, how much will it help with your engagement. My best guess, if you use the software the way your customers or followers have never seen before, then you will be the talk of your customers and followers and your following and engagement will increase dramatically. 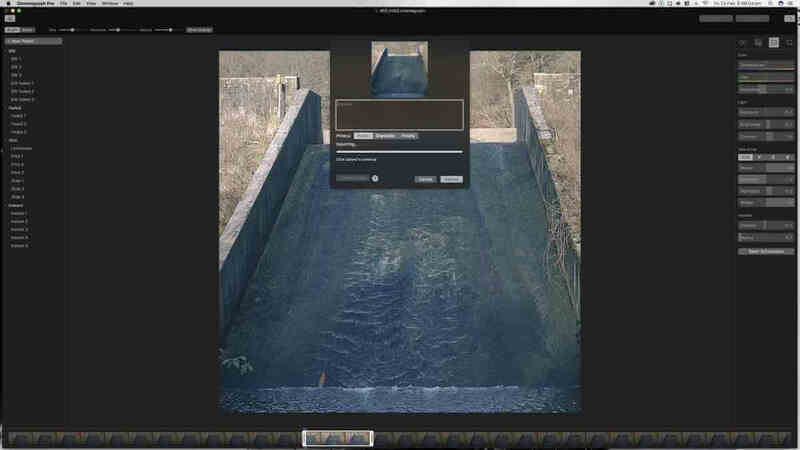 The Cinemagraph Pro has way more options which I was not able to fully cover, but you do have a lot of tutorials at your disposal for the Business Plan. Yes, Cinemagraphs are revolutionising social media already. If this app continues to grows in popularity, then I can see an affiliate programme being introduced in the near future. Cons: I am not aware of a Windows or Android version of this software. *Disclosure: We were given a years free subscription to the Business Plan in exchange for this review. All footage used in this review was recored on my Nikon D850. What a clever app. The images created are so impactful. I think the movement in the flag is my favourite. This is a very interesting tutorial – I have seen so many dynamic images on Instagram and been wandering how everyone creates them! It is time consuming but the results are SO worth it. The app is very simple and easy to use with a tonne of tutorials available too. I’ve been seeing these cinemagraphs all over the place. I really want to try it out myself! They are surprising easy to do with just a mobile phone and small tripod. I am working on a few and I hope these pay off too. This is so clever! The pictures look so impressive, and the clarity is amazing. Photography is such a underrated skill, it really is an incredible art! Photography is one of my strongest skills and I was so interested in this review. Wow! Your images are fantastic, and such a great tutorial. Lots of people have started using this for Instagram and the results are there to see. This is a clever little program! It seems quite expensive though, in my opinion – especially as there are other moving images now available on all Social Media platforms that help jazz up your posts and improve engagement. I’m sure some people out there can get a great result from it though! The results are very impressive. I have been using this app for a while and I hoping this will be a way to get a few clients too.